From Romance Writers of America comes a never-before-published collection of tales that showcases the breadth and complexity of the world's most popular genre of fiction! New York Times best-selling authors Cindy Gerard and Allison Brennan bring the thrills in their tales of romantic suspense. New York Times best-selling authors Sabrina Jeffries and Courtney Milan take you on a trip back in time with lush stories of historical romance. New York Times best-selling authors Vicki Lewis Thompson and Joan Johnston show the wonder of contemporary romance while New York Times best-selling authors Monica Murphy and Laura Kaye's New Adult romances delve into the evolving Millennial perspective. 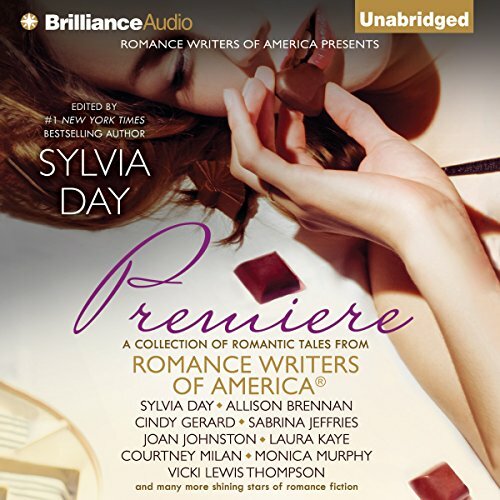 And editor and number-one New York Times best-selling author Sylvia Day's tale of angels and sizzling desire takes listeners to the edge with paranormal romance. From the first love of young adult romance to tales of second chances, from LGBT romance to the realms of the supernatural, from contemporary to historical, from suspense to inspirational, the genre of romance has a story for every listener, and this blockbuster inaugural collection from Romance Writers of America showcases it all! © 2015 by Romance Writers of America. P 2014 Brilliance Audio, all rights reserved. Introduction © 2015 by Sylvia Day, LLC. "Ravished by the Geek" © 2015 by Vicki Lewis Thompson. "Under a Wicked Moon" © 2015 by Tanya Michna. "A Right Honorable Gentleman" © 2015 by Courtney Milan. "Station 12" © 2015 by Amber Lin. "Wrong Number, Right Girl" © 2015 by Monica Murphy. "A Light in the Darkness" © 2015 by Regina Lundgren. "Coming Home" © 2015 by Joan Mertens Johnston, Inc.
"The Poet" © 2015 by T. L. Costa. "Dead Wrong" © 2015 by Cindy Gerard. "The Fallout" © 2015 by Harper St. George. "Hard To Breathe" © 2015 by Sylvia Day, LLC. "All I Want" © 2015 by Erica Ridley. "Covering Her Skin" © 2015 by Laura Kaye. "The Long Way Home" © 2015 by Katharine Gilliam Regnery. "Their Night Off" © 2015 by Allison Brennan. "Flying in the Face of Convention" © 2015 by Lex Valentine. "An April Fool’s Forbidden Affair" © 2015 by Sabrina Jeffries, LLC. "Wrong Address, Right Guy" © 2015 by Diane Kelly. Quick listens, some better than others. But - if you need distraction and/or have a short attention span, short stories work. Easy listening - some more graphic than others. Quite diverse. I thoroughly enjoyed a lot of the stories some of them made me want to read more of specific authors books. There is a nice variety for everyone. All in all it was entertaining. There’s something for everyone in this patchwork of authors and performers. It allowed me to try some formats I might have skipped. Variety is the spice of life and love. Some of the stories were amazing and some were just okay. They also were performed very well. These were the most boring stories I have ever heard. I hope that I never come cross another book like this. There were a few that were decent. The rest could not hold my attention.